Conservatories are designed to create extra light and space for your home, as well as providing sophistication and a modern appeal. With blinds you’ll add to this appeal and with a number of styles and designs to choose from there’s something for everyone. Blinds look brilliant in rooms such as the kitchen, bathroom and conservatory. 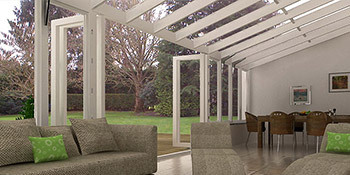 Although conservatories are often built to bring in plenty of light, there are times you want to limit this. With blinds you can control the amount of light to enter the property. Vertical slats form this type of blind and they’re perfect for large windows and doors, as they’re able to let in as much or as little light as you want. There are plenty of materials to choose from too, with aluminium, wood and stiffened plastic all available. Roller blinds are a popular addition to homes and offices because of their great functionality. They’re often made from plastic and are great in bedrooms for eliminating light in the mornings when fully closed. While being simple and versatile, roller blinds are also viewed as an elegant blind variation and with a range of colours and designs you can find something that suits your taste. For the luxurious bedroom, Roman blinds are a household favourite and are often made from softer fabrics for aesthetic appeal. They have a similar design to roller blinds, and can be altered with vertical movements. Venetian blinds are probably the most popular style in the UK and are formed from horizontal slats which are suspended from a cord or strips of cloth. With Venetian blinds you can rotate the slats up to 180 degrees, giving you precision of exactly how much light is filtered into the room. Venetian blinds can be constructed from a number of materials including metal, wood and plastic, so there’s something for everyone. If you’re looking for a stylish finish for your conservatory, then look no further than window blinds. They allow you to control how much sunlight is allowed to enter your conservatory, restricting heat in the hot summer months. If you’re interested in conservatory blinds to improve your lifestyle then complete our quick quote form and receive up to four FREE quotes from local, vetted and reputable professionals. With window blinds you have the opportunity to complete your room’s look with a stylish and decorative feature for the windows. With a variety of benefits and styles you can find something that’ll suit any room in your home. Properties are given an energy rating based on how efficient they are and ratings are displayed in the data underneath. This ranges from A, by far the most energy efficient, to G, the very least efficient. With a higher rating you're more likely to have less costly energy bills as more heat is going to be retained in the house. You can enhance your home's efficiency with insulation including double glazing, loft lagging or wall cavity insulation. The information beneath shows the various types of properties within Uk. The most commonplace homes all around the UK are detached and semi-detached houses. Various other households include terraced houses, flats, converted flats and bungalows. The pie chart underneath displays the percentage of households in Uk that are central heated and non-central heated. Central heating figures in the the vast majority of UK houses, such as those on the gas grid and properties heated by oil and electric. The information beneath shows the spread of households warmed by various fuels. Around the United Kingdom the most frequent by far and away are gas heated homes, followed by electricity and then oil. Biomass boilers are also increasing in popularity, heated by environment friendly products like wooden pellets or agricultural waste.|Houses in Britain are warmed by a range of fuels, such as gas, electricity, oil, solid fuel and LPG boilers. Each fuel has a varying cost associated with it and that means you might find yourself with more affordable energy bills by changing the way your house is heated. Even solar thermal panels are being regarded as by many as a way to lower heating bills for the years to come.